JEE Mains 2019 is just around the corner and students are preparing for the exam. Chemistry is one of the most scoring subjects among PCM, where students can score 100% if their concepts are strong. It can be easily tackled if you revise and practice regularly. Here, Embibe brings some important tips that will help students to prepare the subject. It is very important for every candidate to have a sound knowledge on the exam syllabus. Aspirants should focus on conceptual clarity, application skills of the subject and should know the exam syllabus completely. All the three parts of Chemistry such as Physical chemistry, Organic Chemistry and Inorganic chemistry are important and interconnected. Candidates should practice the most relevant numerical daily to increase speed. It is advised to pay special attention to topics like Electrochemistry and Chemical Equilibrium. Students should concentrate on attending classes and laboratory lectures. Perform each and every laboratory experiment. If you perform the laboratory experiments and see things happen, you will remember it for a longer duration. Try and grasp the concepts and always ask questions. It is important to make a list of unanswered questions and ask to discuss them with a teacher or a peer. Do not ignore numerical problems even if you are weak on it. Most of the times, the problems are the direct application of the formulas in use, and at times, they are mixed with your understanding of a topic. The numerical problems are a good way to score marks if you are mastered on that subject. After you finish your syllabus, revise as many times as possible. Make the chapter wise revision as a part of your practice. Don’t forget to take chapter wise mock tests to improve your score and performance. Try to focus on the weak areas. Taking Mock tests are an important part of your revision. Embibe will not only give you an in-depth analysis of where you need to practice more but also on how not to lose marks. It helps you with not only on basis of subject and chapter wise performance as well as concept wise revision. Here as per research, we are providing the easy but important chapters in Chemistry. It is true that it is impossible to predict 100% accurately. Embibe’s experts are giving the suggestion for prioritizing their task. 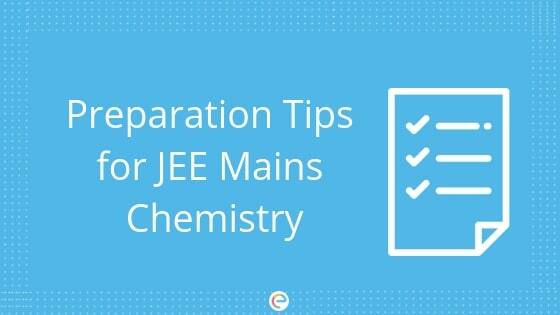 You also can take a look at IIT JEE Chemistry for preparations as well. Chemistry is a scoring subject, yet many students fail to score good marks in this subject. The only reason behind it is that they fear from chemistry. It is important to remove any phobia from your mind if you want to perform better in Chemistry. Chemistry is one of the easiest subjects if you study it with full concentration and consistency. Most importantly, don’t forget to take mock test/sample papers regularly to improve your time management. It will give you the extra needed mileage to the successfully clear competitive exam. Embibe wishes all the best to every candidate taking JEE exam!